February 13th 2017. CAC Global Citizen Taylor Allen writes about her experience working with CAC and G.O.A.L.S. Haiti in Léogâne Haiti. Passing through Port-au-Prince into Léogâne took us from a concrete city to the tropical countryside. Just beyond the street borders to the west was the ocean and to the east was flat land full of sugar cane stalks reaching about four feet to six feet tall surrounded by palm trees bearing green coconuts. In the harvested areas animals roamed such as cows, pigs, chickens, goats, and horses. The air was cooler and lighter from the ocean breeze than the middle of the capital city, also not as many people or cars on the road. When we arrived to the apartment the entrance was secured by a giant metal blue sliding gate that covered the driveway at the curb. Once the security guard pushed it open we saw the entire driveway made of smooth oval black and gray rocks that crunched underneath the tires. There were bright white buildings embellished with blue and green accents from the color of the doors, window shutters, and staircase railings. In the middle of the driveway stood an enormous lush mango tree with green mangos dangling from the branches. The program consisted of around twenty five coaches from G.O.A.L.S. 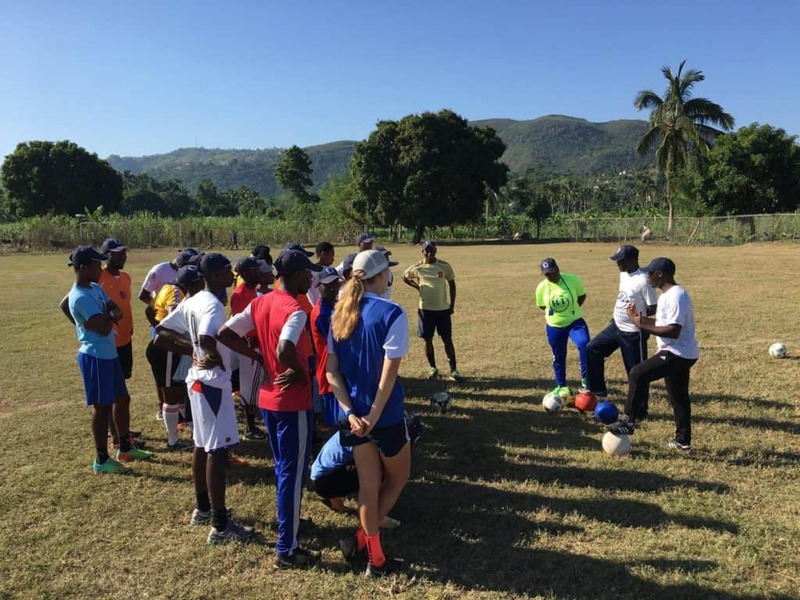 Haiti – a sport-for-development nonprofit organization helping children and teens in Haiti through the love of soccer. Many of the coaches met us at the G.O.A.L.S. office; the apartment we stayed in sits just above it. The G.O.A.L.S. Haiti staff share a white pick-up truck and every morning there would be around ten coaches in the bed of the truck ready to hitch a ride to the field for training. Being welcomed by that type of energy every morning was uplifting to say the least! We would open our door to come downstairs and around five to ten coaches would greet us once we were down by the mango tree. The field we got to play on was a grass field enclosed by a chain link fence with several openings that would later allow for chickens, goats and stray dogs to find themselves roaming around our trainings. At one point, a goat found herself in the middle of the goal when we were about to do a shooting game. Other fields were right next to sugar cane areas with cows, pigs, and horses within a couple yards of the field. The background was a scenic view of green mountains with the sun setting just over the horizon. It was a stunning view with the green mountains, tall palm trees with coconuts, lush sugar cane fields, and animals roaming around filling the landscape. This week we were accompanied by Community Impact Coaches (CIC’s) from the Haitian Initiative Program. 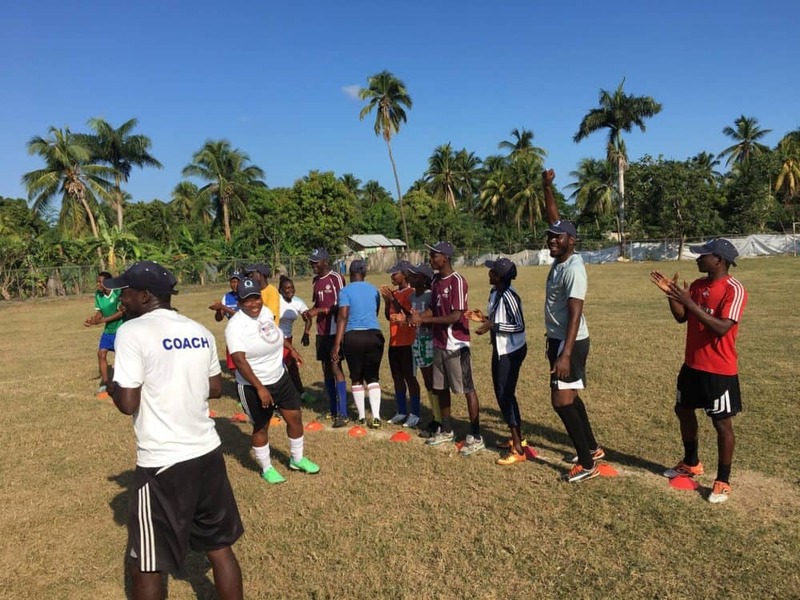 These particular Haitian Initiative coaches have been a several year partner with Coaches Across Continents and have been noticeably impactful in their communities by using CAC curriculum. The CIC’s are there to support CAC in delivering the curriculum side-by-side to other partners, with the hope of Haitian Initiative and G.O.A.L.S. Haiti to join forces and continue to build onto each others’ positive impacts in communities throughout Haiti beyond the borders of their own cities. It was great to see other programs with similar missions coming together and discussing how they can join forces to create an even bigger ripple in their communities. One of my favorite moments from the week in Léogâne happened after the first day. A young woman who speaks English, and is an English teacher, came up to me and told me she learned two things that day. I was excited she opened up to me after the first day to share! I hadn’t experienced that in the three weeks in Haiti. She continued to tell me about her two favorite games from the day. She loved Mingle-Mingle and the Financial Literacy game. In Mingle-Mingle one of the questions asked was to get together with people of the same faith or religion. There were about five groups, and this woman, was actually standing alone. She mentioned she was Mormon, and not a lot of people in her community were Mormon, and for that moment on the field, she realized religion doesn’t have to be a conflict point. She learned that no matter what religion another person is they can still get along, they can still bond and work together on the soccer field, and they can still bond and work together off the field. I thought that was really neat to hear! In the Financial Literacy game she mentioned how she learned about taking ownership of her income, educating herself about options, and becoming empowered to make her own decision about whether to save, spend, or even invest. She never thought about investing or making investment purchases to move closer to her goals. Both comments really solidified positive outcomes and impacts the CAC curriculum can have on people that participate in these programs. It’s often difficult to see any sort of impact made in a week with people who speak another language, so it was reassuring for a participant to share these lessons with me. From the tropical setting, plus three organizations joining forces, in addition a woman opening up about lessons learned after day one – needless to say, this was an incredible experience. Coaches Across Continents is creating a safe space for their partners to have conversations around forward thinking and challenging harmful societal traditions in their communities all driven by the participants themselves. CAC is empowering individuals to think creatively, to challenge harmful mindsets, and to envision a better future; all through sport! The Self-Directed Learning model (SDL) is giving opportunities to people who want to see a change in their communities for the better. They are equipping participants with curriculum that can open up the conversation around improvements within themselves, their teams, their communities, and ultimately turn them into action plans. I am proud to be a part of an organization so driven to create a better world, one partner and community at a time. Keep up the great work CAC!